bintracker is here. It's a new beeper music editor (and in the future, possibly more than just beeper), inspired heavily by both 1tracker and Beepola. At this point, it supports betaphase, PhaserX, PhaseSqueek, and Pytha. Bintracker runs on Windows and Linux. It should be possible to build it on MacOS, but I haven't tested that. Bintracker runs libmdal as a backend, so in theory it can support any engine that is supported by MDAL. However, at the moment, bintracker only implements ZX Spectrum 48K support. Also, MDAL/libmdal is still in it's infancy, and will have to undergo some major changes before moving forward. Bintracker is currently in a very early beta stage, so bugs will be a common occurance. Please report them here, or (preferably) hrough the github issue tracker. Massive thanks go out to Shiru, who got me started by tossing around the idea of having "some sort of an MML compiler for beeper". Also, bintracker would never have been possible without the amazing 1tracker, which will, without a doubt, remain my favourite tracker. Another big thanks goes to Chris Cowley for all the work he's done to almost single-handedly kicked beeper music into the 21st century with Beepola. And of course, big thanks to all beeper fans, 1-bit musicians, and especially beeper engine authors! Great stuff, more the merrier, especially with new ideas on tracker internal architectures and UI design. One bug report so far - when I closed program, Windows error occured, 'the program was stopped, close it?' (not sure how it is in english, I'm on localized Windows). That's an odd one. I assume that on your system, bintracker.exe fails to be registered as non-console app. Which Windows are you on? Does the error also occur when you start bintracker via console? There's also an issue with the exit confirmation on unsaved changes, message box will show a single "OK" button instead of the 3 custom ones it should show. This is a problem with the gfx lib, working on a work-around atm. I'm on Windows 7 x64. Tried it few more times, there was no crash, but the app remains in the processes. Maybe this help to locate the issue. I've been on http://download.gna.org/allegro/allegro/5.2.1 but it doesn't download anything. FATAL ERROR: Allegro initialization failed. => EDIT I've removed all other allegro lib I've had, now I can launch it, but the window screen is flashing!! It can play sounds, though. garvalf: That's very odd, can't wrap my head around it. I just pushed some changes though, could you try to 'git clone https://github.com/utz82/bintracker.git' and compile that again? Btw -no-pie is only needed on new GCC, to force it to produce actual executables. Wow. I mean 4.8 isn't exactly fresh, but one would expect that they'd be done implementing the C++11 standard at that point. yes, that's the problem with LTS, it's supported until april 2019, and they release latest packages for Firefox, Libreoffice, and all that sort of stuff, but for development packages you stay with the old ones. And they made also a stupid decision for the linux mint "KDE" version, you can't upgrade to latest version (18) because they said new KDE 5 version (plasma) is so much different that you have to install a new fresh version of the system, which is a complete PITA. I've compiled bintracker with your modified line. And now it works on my main computer!! Great, I'll be able to play with it. Thanks a lot! it seems in bintracker it's called SLSPD. The same goes for DMOD1 which is called DMODA now. I've worked a bit with bintracker. Very pleasant and quite intuitive to use. It reminds me somehow of 1tracker. I've changed the colors in the settings.ini, now it looks so nice. I've set the keyboard to FR. Now I have something odd. I won't open an issue because it's maybe a quick fix. Alt+1...+5 is working fine for changing the octave. Alt+6 is decreasing the length of the song instead of choosing octave 6! Alt+8 is increasing the octave, as expected. Alt+7 does nothing. In english keyboard mode (I've changed my keyboard with setxkbmap us), it's similar, except that alt+6 is working as expected. So as I said, I saved my file first, then made a new version with more data in it. Then I removed some rows with the alt+6 command. I didn't want to undo, so I just saved my file under a new name, and compared it with the first version with a diff tool to retried the infos from the deleted rows. For the deletion of some notes, I found it strange that "del" is shifting all values in the column up. Probably some trackers are doing this as well, but I think it's more commun to just delete the value with "del", and shift values up with "backspace" (like in 1tracker or milkytracker). But we can get used to it. Also the problem is sometimes the keyboard responds odd and I get two inputs instead of one. So instead of deleting 1 note I wanted to remove, and stay on the same place, it will delete the note and the next one not supposed to be removed. Now I'm working more on my tune! The manual also says "Any patterns not used in the sequence will not be saved in your module file, and will be lost when you exit Bintracker or load another track.". I find this very dangerous! Deflemask is doing the same and I've already lost some patterns because of this. Is there a reason you can't keep it in the mdal file? It wouldn't cost much space in the source file. I would find this more secure. Yet, when I've loaded my mdal file, all my cloned patterns, which are not used in the sequence, were still present in the file. So I don't understand this warning, maybe it's not implemented yet? Now for the bug, with the FR keyboard, when I want to enter for example blk1, I type blk shift + 1, and instead I get blkampersand, same for eacute instead of 2 etc. Waaah, so many things Ok, I'll go through them one by one. Hmm, that's not good. Unfortunately it's not a quick fix, because it looks quite correct in source So I will have to investigate this. Edit: Ok, found the problem. Now, how to fix it is another question. Edit2: Alt+6 should be fixed now. Alt+7 I can't reproduce on xkbmap US, is it still broken for you? For the deletion of some notes, I found it strange that "del" is shifting all values in the column up. Probably some trackers are doing this as well, but I think it's more commun to just delete the value with "del", and shift values up with "backspace" (like in 1tracker or milkytracker). But we can get used to it. Also the problem is sometimes the keyboard responds odd and I get two inputs instead of one. So instead of deleting 1 note I wanted to remove, and stay on the same place, it will delete the note and the next one not supposed to be removed. Jangler commited some code yesterday which should, in theory, fix this issue. Though it's quite likely the bug is still there. Let me know if this keeps popping up. I agree, it's somewhat counter-intuitive at the moment. Arrow keys should be possible. Mouse support would be great, but very difficult to implement. Still, it should happen at some point. This works the same way as the "special" commands. Just type some letter and you'll get the drop-down list. Hmm, so maybe I didn't implement it like that after all? *head scratch* That'd be great, actually! I'll check if this is really "safe", and adjust the manual accordingly. You mean it actually lets you enter a literal &? Dafuq... I mean you're not supposed to use shift for the numbers, but also bintracker should actually not let you enter invalid strings like that. 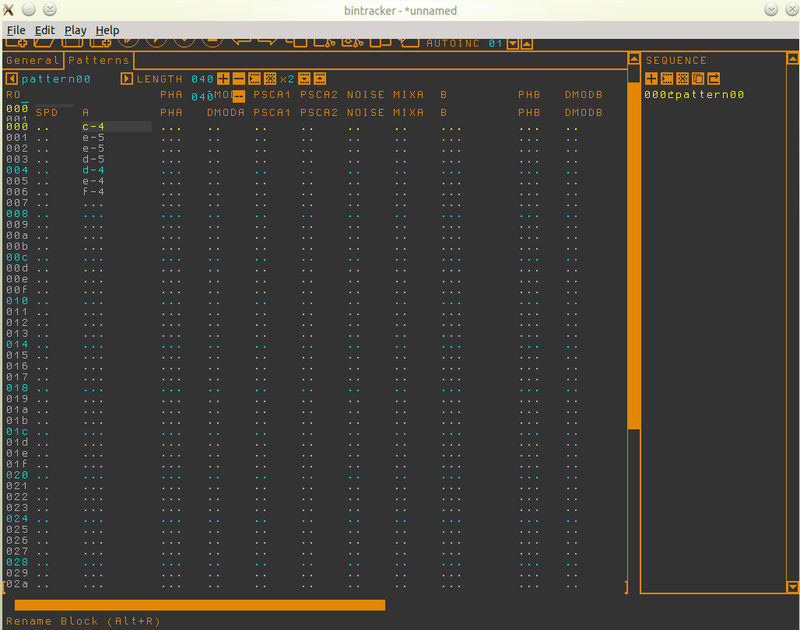 just for the record, I'm making a song in adlib tracker, and discovered the del key is working like in bintracker. I'm not a big fan of this, but it can make sense. Do as you wish, or make a survey (or an option in the config file)! I've tried my binary (which is working) on my main computer. There are still the flashes. I think it's because of the graphical board, it's ATI and sometimes I have odd things on this computer. alt+6 is working now. alt+7 does nothing, either in French, EN or DE (with the associated setxkbmap). I'm wondering if it's not the stupid windows manager (kde) which is doing this. Yeah, I've checked it, they have a shortcut (well hidden), with alt+`. But ` should be with altgr, not just alt. Anyway, i've removed it and it works now. On the Mate desktop, there is also another shortcut associated to this key combination! I've only tested quickly, i looks ok so far but I should check more and better. yeah, with arrows it would be great. Mouse is not mandatory, as we often use keyboard more on a tracker. yes, with or without shift it's the same: I get the litteral replacement for the symbols, "minus", "amperstand" etc. It's something from allegro I think. It's only on French keyboard. I've implemented a fix for the "symbols instead of numbers" problem. If you have some time to test, please let me know if it works! I've compiled the latest version from github. Now when I enter the field for changing the name, if I type something (number or letter), it just hangs the window, I cannot exit the field. I can still navigate in the menus, but can't exit from there either. then run bintracker from console, try to enter some letters and numbers, and tell me the output? this file only has 766 lines! I've done it, but unfortunately, there is no output! hmm, maybe it's something else, because it still hangs if I change language in settings.ini or if I comment your modified code. Maybe it's a problem on this 3rd computer. I'll test it on tuesday on the others. I made the compilation via ssh, using a remote computer. ah sh**, I've double checked, I've even compared with the code on my other computer, and didn't notice it was because of this. Thanks. But it's the same, it hangs. Now I must just test with my other computers which were working before. when I pass the mouse over a mixed up icon, it displays just below the menu, it's just shifted. It happens at random.